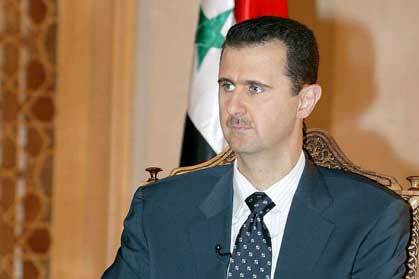 Syrian President Bashar Hafez al-Assad. “Haunting images of entire families dead in their beds,” tweeted U.S. Ambassador to the United Nations Samantha Power on Monday. It sounds like we may be going to war. There can be few more compelling reasons to engage an enemy than a regime that is using rockets filled with chemical weapons to kill its own children. On Monday Secretary of State John Kerry announced that there was “undeniable evidence” that chemical weapons were being used in Syria. “The indiscriminate slaughter of civilians, the killing of women and children and innocent bystanders by chemical weapons is a moral obscenity. By any standard, it is inexcusable and – despite the excuses and equivocations that some have manufactured – it is undeniable,” said Kerry. So here we go again. Another ruthless dictator in the Middle East in an oil rich nation who is determined to hold onto power, even if it means turning his own nation into a graveyard. We should learn something about the hard nosed realpolitik of such leaders from watching the Assad regime do what Saddam Hussein did before him -- brutally laying waste to his enemies using every means possible. If you're murdering children by the thousands, if you're displacing millions of your own people and driving them across the border, if your capital city is a smoking ruin and warships are assembling in your harbor, wouldn't you at some point turn and ask yourself what on earth you had become? No, apparently. You would not. Because you would never have had any reason to. If you've been raised to understand that control of your nation’s oil reserves is a Get Out of Jail Free card that you can play over and over until both your feet are in the grave, what would stop you from playing it? If your own citizens are lowly pawns in a game that's played far above their heads, if the reality of their hardscrabble lives is of no political consequence, hence no interest, what reason would you have to see them as anything other than chess pieces in a game that you call and control? For decades -- for centuries in fact -- we in the west have permitted or encouraged tyrants in the Middle East as long as they provided no challenge to our overriding interests. We've been prepared to look the other way when they bombarded each other and set their cities alight. We don't engage them on their social or religious customs. They got the message too. Look how long, just look how much it has taken to call Assad to account for his heinous crimes. Even now it remains to be seen how much justice he will eventually receive. Behind all this politicking and slaughter lies a question that most of us hope never to be asked, never mind answer. It's a question that has been asked in blood through all the ages and the fate of nations hangs on it. It's a simple question. What sort of country are we? Behind Assad's barbarous campaign two larger players, President Obama and Russian President Vladimir Putin, are pouring over the map of Syria and girding for conflict. The task our president faces is formidable. Obama must act and at the same time convince Putin that such action is not a threat to Russia’s interests in the region. Squaring that circle has been the reason for the reluctance to engage. That reluctance has emboldened Assad, who seems determined to cross every “red line” placed in front of him. In one sense it's astonishing and reprehensible that this kind of medieval conflict can even occur in the 21st century. But then again, think of the potential rewards. Those rewards – power, money, access – are Assad's lifeblood. He believes they are his birthright. Nothing in his life before has ever conspired to teach him otherwise. He's a monster. A monster that for decades we help enable. It would be productive, I feel, to ask ourselves why we still indulge them so enthusiastically, when we know what they grow into and where it almost always leads.